Faith ~ Cade Walker is like no man I’ve ever met before. He’s cynical, brooding, mysterious and, most of all, damaged. He’s a man who declares he’s broken, and one who detests the two very things I live for most: God and love. Yet, I’ve still fallen completely in love with him because I also see the good, something that no one else ever has. I see a man who is strong, silent, honorable and beautiful. He’s a man who is now scarred just as badly on the outside of his body as he is on the inside, all because of me. One who endured severe torture in order to save me from what would be the worst thing I will ever experience in my entire life. He is a man I call my dark angel, one who will have my heart until the end of time, even if I can never have his. Cade ~ At fifteen years old I lost the only person that ever mattered to me, and the day I lost my little sister in the most vile way was the exact moment I stopped living and only existed. That’s until ten years later, when I walked into an open field in Iraq to hear the most incredible voice I would ever hear in my life. One that rooted me to my spot, and ended up belonging to the most beautiful woman in the world. The only woman to ever make me feel something again, something that I thought was dead inside of me. And no matter how badly I wanted to keep her, I knew I couldn’t. Not with what I have lurking inside of me. It’s something I’ve always kept hidden. That is, until the day I unleashed it on the people who dared to hurt her. It was the one thing that gave me the strength to save us, but it was also the one thing that would remind me of why I could never have her. When I went into this book, I was not expecting for it to touch me in the way that it did. THIS BOOK was amazing, and I fell a little bit in love with the author for writing a story that had plenty of depth and emotion that will stay with me for a long time. The prologue alone was enough to prove to me that this book would be a winner. Cade Walker is a Navy SEAL who is on a mission in Afghanistan when he stumbles across a fellow American, in the form of a beautiful woman called Faith who is working out there as a missionary. He spots her playing guitar and singing to a local boy called Aadil, who is risking his life by just being there. That is until something unthinkable happens, their lives are changed forever and Cade and his 2 best friends, and brothers in war, are forced to act. From the heartbreaking prologue to the heart-warming epilogue, everything in between was well paced. The character development was spot on and I was never once bored. As soon as one plot-line was wrapped up, there was another to take it’s place. There was a lot going on, but not once did I feel that it was OTT. It was just right, for me. I have so much love for FAITH, who was smart, sassy, innocent but not naive, and selfless. She was what I look for in a perfect heroine, I do not have a bad word to say about her, whatsoever. Cade was a broken hero, with a HUGE heart and a dirty mouth. How much more perfect can you get? Then there were the side characters, especially Christopher and his little sister Ruthie. Two wonderful children, one who was a boy trying to be a man to protect his sister, and a little girl with a speech impediment and no friends, who just wanted to be loved. I adored them. So much. The steam was off the charts, the emotion was real and the depth of the story was superb, there were so many layers to this story. I have not read the first two in this series, but I can tell you now that I will definitely be going back to read the first 2 at some stage because Jaxson and Sawyer were two characters I’d love to read about. I LOVED THIS BOOK and I will be adding KC Lynn to my auto read list. 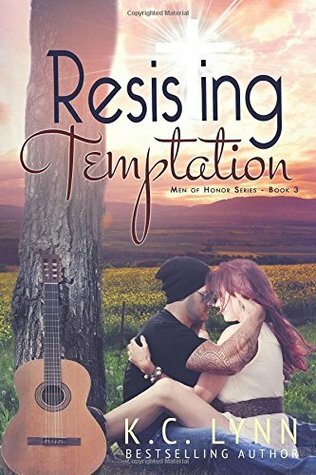 Resisting Temptation is a standalone romance, told in dual POV.